What is the best way to overcome all the "looks" as if your doing something wrong when taking a photo? Hundreds of times. You just ignore the looks most of the time. Occasionally people will ask what's going on - I just tell them the truth. Sometimes they think you're there to photograph a celebrity and go away most disappointed when you reply "a bus". Other people are genuinely interested and like to know what's going on and why. I had 3 or 4 people ask what was happening during the recent "old buses on the 159" day. It is worth familiarising yourself with the legal position re photography in a public place just in case the police ask questions - I've had that umpteen times too and have never given my personal details to the police because they've never demonstrated reasonable grounds of an offence being committed. You may get bus drivers yelling at you or giving you the "vees" or "w*nker" sign. I just report them to the bus company and send in the photo if they happen to do it when I'm taking a photo. I can't be bothered to take insults from professional drivers - on their own heads be it if they want to act like immature morons. The other thing you'll get "is you can't take my photo with my permission" - err wrong. Yes I can if you are in a public place. You may also get the other classic of "this infringes my human rights" - err wrong again. There is, unfortunately, a significant minority of ignorant / ill informed people who think they understand law about photography and they're clueless. Security guards on building sites are a classic example I'm afraid. You do have to be careful on some bits of what looks like public land but isn't - it's private property. Places like Canary Wharf, Kings Cross redevelopment, the land around City Hall on the South Bank are all examples of "privatised" public space. You can get hassled by security people there if you wield something like a decent SLR camera because they think you're a professional rather than a tourist. I'd just point out that I have a slightly sour attitude to being stopped and challenged. I've no idea why I've been stopped as many times as I have as I am law abiding, careful and considerate when I'm out and about with a camera. Other people seem not to have the number of challenges I've had. Thank you for the advice. I once went to photograph a school route but the looks from parents/kids outside the gates put me right off. The word "Perv" springs to mind!! Given today's hysterical approach to child safety then taking photos near schools is an utter no no. I take photos of school services away from school entrances. I once took some photos of the JFS routes at Kingsbury roundabout which is away from the school but one school kid came past and said "you can't take photos here". I just ignored him and carried on. The point in all of this is it is the vehicle and its surroundings that are being snapped. It is not the driver nor the passengers that are the subject. If the driver doesn't do anything silly and people don't gawp out of the windows then they're unlikely to be distinguishable in the shot. Drivers are usually only identifiable if they lean forward or make a gesture. I quite like to get some people in shot if it helps the overall composition - buses are supposed to carry people. I've inserted an old photo of mine of High Street Ken to show what I mean. There are people in shot but they frame the buses. 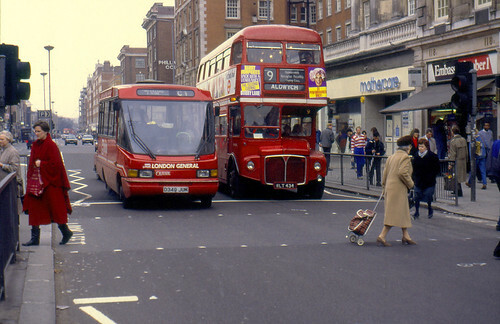 I happen to think the old lady with the trolley makes the shot (others may disagree) plus the newsagents with all the cigarette adverts - don't see that any more so the shot is "of its time". This is why I try not to just take the usual "three quarters" view of a bus (boring yawn!). I agree - I've even said to drivers before when asked that it's the vehicle I have interest in not you - don't be flattered!!! I must admit that is a very good shot. As you say, it is pretty clear when this was taken - how times have changed. I somewhat agree that the little old lady "makes" the photo. Something about the trolley. I would be tempted to go back to the same location during 2016 and do a "then and now" shot just to show the differences. Like you said about the drivers, they only appear in the shot if they are doing something out of the norm - such as having faces covered with duty cards or fingers in the air. The only problem I have when someone photographs my bus is that I never seem to see it anywhere online. I just want to be famous! Same point. 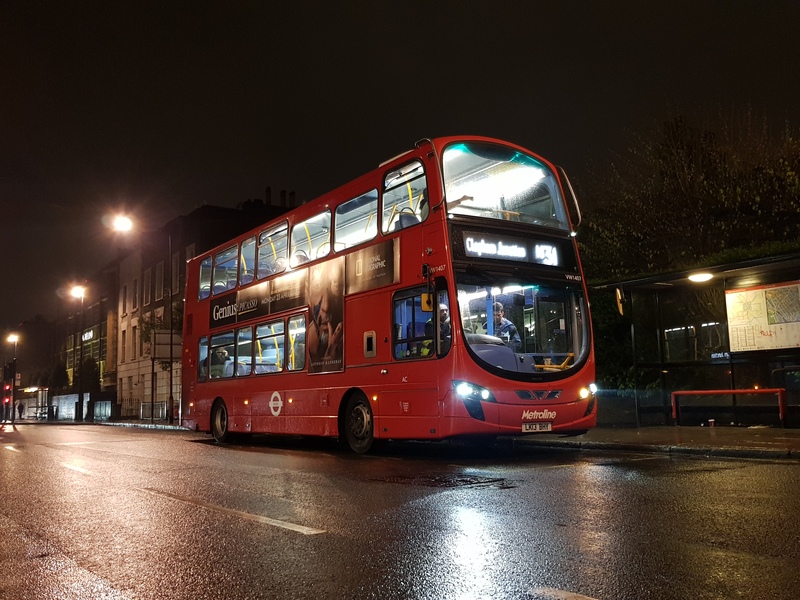 I am all for enthusiasts taking photos of service buses, but as a driver it is nice to be able to see yourself online driving your bus. 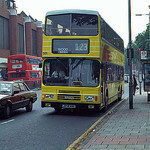 If any bus snapping people are on here and if you happen to photograph any 172, 188, 381 or 484 let me know. Oh you will haha, youngish driver, getting on a bit though. In the past 18 years I've found one of me driving a bus and 2 of me in a coach. There must be loads out there! If the date on the tag is definitely the day it was taken, I was in hospital for my sons arrival into this world lol. if it's who I think it is, he's one of only 7 of the original 26 drivers that started when the route did.